Evomail is an interesting new email app (Gmail only for now) for the iPad. 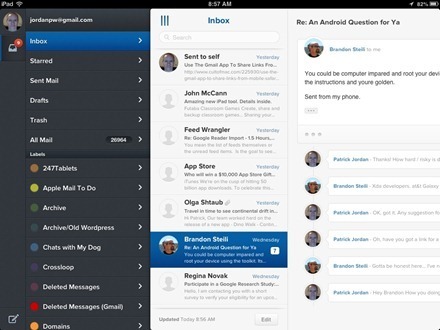 Evomail is modern mobile email for your iPad. Designed with three guiding philosophies of being beautiful, frictionless and simple, we’re bringing a refreshed mail experience to your iPad and evolving the way you use email on the go! I saw this described somewhere this morning as being a bit like the Sparrow email app that Gmail bought up. Like many others, I was a big fan of Sparrow before Google gobbled it up and made clear they had no plans to continue its development – so I was immediately keen to take a look at Evomail when I saw that comparison. I’ve only had the app installed for a few hours, and though it doesn’t remind me that much of Sparrow it does have a fairly light and clean UI. And it’s comfortable to use. For me, it’s already one huge step ahead of the much-hyped Mailbox app – because it supports GMail labels. — Gmail only at the moment, though its App Store page notes ‘with additional support coming later’. The app is getting slammed with one-star ratings in the App Store, purely because it’s Gmail only and it appears a number of people didn’t bother to read the App Store description properly. — Support for and easy access to Gmail labels, as well as archives and trash. — Sharing to Twitter, Facebook and the web. The app’s page load and refresh times are not stellar at the moment, and search is slow a little broken looking as well – so the app is feeling like the 1.0 version that it is. 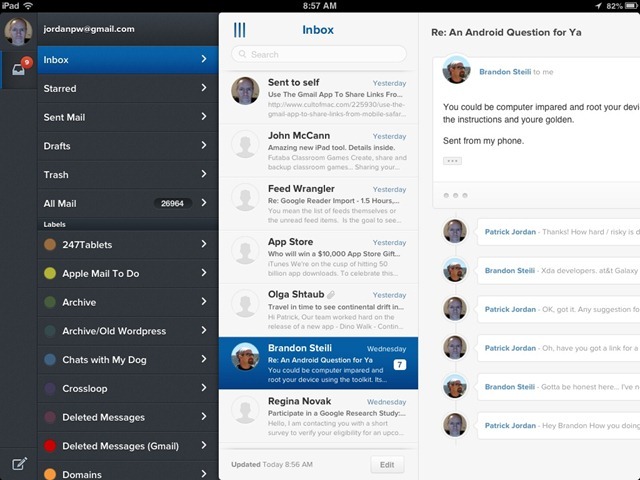 It has promise though as another alternative to the built-in Mail app on the iPad. Here’s an App Store link for Evomail; it’s priced at $2.99. Have any of you tried out Evomail yet? I just gave Evomail a whirl on my iPad. I like what I see but one thing I’m not digging is I like to emb Jpg pics into the face of my emails to remind me of things..like clip pics of stuff I want to buy, check out and stuff. This email program just displays my jpgs as a broken blue graphic icon, unlike Gmail’s app which displays it right there in the body of the email. If that is an issue, it is useless to me. I just emailed them for help. I dunno if this is their issue, but I can’t find where to even begin to make that right.